Duchenne muscular dystrophy (DMD) is a degenerative neuromuscular disease leading to progressive muscle weakness and loss. This review discusses advances in understanding the natural history of DMD, as well as recent pharmacotherapies. Decline in expiratory and inspiratory pulmonary function results in ineffective airway clearance, sleep-disordered breathing and nocturnal and daytime respiratory failure. Routine measures of pulmonary function include forced vital capacity (FVC) and peak expiratory flow (PEF). Both measures follow parallel trajectories and relentlessly decline, reaching the lower limit of normal of 80% of predicted at early teenage years. 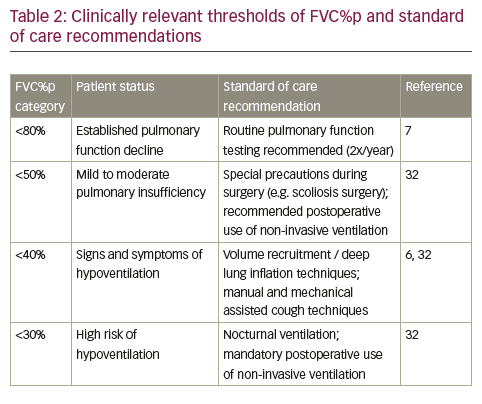 Moreover, decline in PEF and FVC are closely correlated with respiratory complications and clinically relevant thresholds for FVC are defined in standard of care recommendations. Glucocorticoids (GCs) delay the onset of pulmonary function decline, but once patients have reached the 80% of predicted threshold the decline of FVC and PEF in GC users and patients not using GCs is comparable. 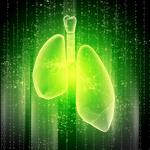 In the successful phase III DELOS trial in DMD patients not using GCs, the short-chain benzoquinone idebenone (Raxone® , Santhera Pharmaceuticals, Liestal, Switzerland) has demonstrated statistically significant and clinically relevant efficacy on expiratory and inspiratory function in patients in the pulmonary function decline stage. These results indicate that idebenone can modify the natural course of respiratory disease progression, which is relevant in clinical practice where loss of respiratory function continues to be a predominant cause of early morbidity and mortality in DMD. All authors act as scientific consultants and advisors to Santhera Pharmaceuticals (Switzerland). Oscar H Mayer has additional consulting relationships with Bristol-Myers Squib, Marathon Pharmaceuticals, Catabasis Pharmaceuticals, Sarepta Pharmaceuticals, Fibrogen, Biogen, AveXis and Hoffman-LaRoche, and is an investigator in the SIDEROS trial. Erik K Henricson is study co-chair of the CINRG Duchenne natural history study and has served as a scientific consultant for Bristol Myers Squibb, PTC Therapeutics and Genzyme, Inc. He received travel assistance from Parent Project Muscular Dystrophy (USA). Craig M McDonald is study co-chair of the CINRG Duchenne natural history study and has served as a consultant for PTC, Prosensa, Sarepta, Eli Lilly, Pfizer, Halo Therapeutics, Cardero and Mitokyne, and serves on external advisory boards related to DMD for PTC and Eli Lilly. Gunnar M Buyse was investigator for clinical trials in Duchenne muscular dystrophy sponsored by Santhera Pharmaceuticals, Prosensa and GlaxoSmithKline, and is senior clinical investigator of the Research Foundation Flanders (FWO Vlaanderen, Belgium). He is also the inventor of relevant patent applications. The publication of this article was supported by Santhera Pharmaceuticals. The views and opinions expressed are those of the authors and do not necessarily reflect those of Santhera Pharmaceuticals. DMD patients and their caregivers consider the preservation of pulmonary function, particularly maintaining effective cough and reducing the risk of airway infections, an important treatment goal,10 which at the current time represents a significant unmet need. The aim of this review is to provide an update on advances in the understanding of DMD, its natural history and recent pharmacotherapies. We will summarize advances in the understanding of pulmonary function assessment in patients with DMD and the natural course of pulmonary function decline. We will also report clinically relevant thresholds of pulmonary morbidity in the context of standard of care recommendations. Finally, we will review the effects of glucocorticoids (GCs) on pulmonary function outcomes and present emerging evidence that the investigational drug idebenone can slow the loss of pulmonary function in DMD patients. 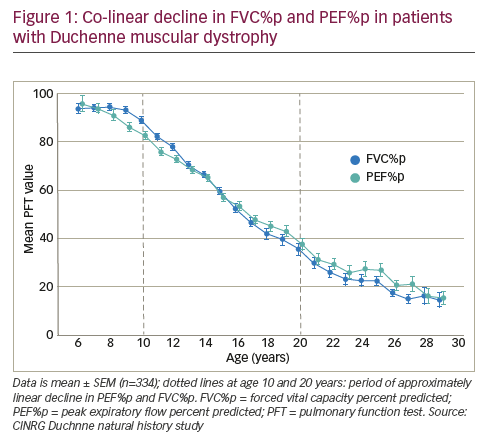 As Figure 1 from the CINRG-DNHS data set shows, flow-related PEF%p and volume-related FVC%p decline in a similar pattern, with decline in PEF%p slightly preceding the decline in FVC%p. At around 10–11 years of age, both parameters fall below the 80% predicted threshold, which is generally defined as the lower limit of normal and defines restrictive respiratory disease or low lung volume.7 From the 80% threshold, both PEF%p and FVC%p follow a co-linear decline, approaching a floor of approximately 20% of predicted from age 20 onwards. From this and other data collections, yearly rates of absolute decline in FVC%p and PEF%p can be extracted (Table 1). Although not directly comparable due to differences in age, GC-use status and other factors at time of assessment, these data indicate a yearly decline well above 5% absolute for both pulmonary function test (PFT) measures. It would be of clinical relevance if loss of pulmonary function could be predicted from or at least correlated with the general disease stage of DMD. As seen from Figure 1, crossing the 80% of predicted threshold for PEF%p or FVC%p and subsequent decline generally coincides with the time DMD patients become non-ambulant during early teenage years. This is supported by baseline data from the DELOS trial18 in 10–18-year-old DMD patients (n=64) where the majority of enrolled patients (92%) were already non-ambulant and at baseline had declined in pulmonary function to PEF%p of 53.8% (standard deviation [SD] 11.8) and FVC%p of 52.8% (SD 18.1).16,18 The predictive value of the age of loss of ambulation was more systematically analysed in a French database with 278 DMD patients.23 This study separated three groups of patients according to their age when they became non-ambulant (age at loss of ambulation – group A: before 8 years; group B: 8–<11 years; group C: 11–<16 years). Longitudinal analyses indicated that early loss of ambulation correlated with patients beginning to lose lung volume sooner, or having a peak vital capacity sooner (group A: 10.26 years; group B: 12.45 years; group C: 14.58 years).23 Moreover, the annual rate of decline in FVC%p was also largest in patients who became non-ambulant at a very young age compared to patients who became non-ambulant at an older age (Table 1). ambulation or the upper extremity function status may therefore provide readily available clinical assessments, which could indicate the need for more intense pulmonary function monitoring and clinical intervention. of hypopnoeas, nocturnal hypercapnic hypoventilation in REM sleep and continuous hypoventilation appeared to be correlated with a drop of inspiratory vital capacity.25,26 Another study29 established a drop in FEV1%p to <40% as a sensitive but not specific marker to predict sleep hypoventilation and hypoxic burden. Clearly, the identification of reliable and sensitive daytime predictors for SDB should constitute an area of future pulmonary function research in DMD. Although FVC%p and PEF%p follow a parallel trajectory of decline, as shown in Figure 1, decline in FVC or FVC%p is historically the best validated pulmonary function predictor of early morbidity and mortality in patients with DMD.7,30 As soon as patients are non-ambulant and FVC%p drops below 80%, regular (2x/year) consultation by a physician specializing in paediatric respiratory care is recommended.7 Once FVC%p drops below 50%, DMD patients may experience early clinical symptoms such as nocturnal hypoventilation, waking at night, morning headaches and problems with concentration and are considered at increased risk for post-procedural respiratory insufficiency when they undergo general anaesthesia or procedural sedation. The risk increases further once the FVC%p declines below 30%.31 Hence, the probabilities to present moderate pulmonary insufficiency is linked to FVC%p of <50% and severe pulmonary insufficiency in DMD is considered when patients have FVC%p <30%,6,23 and preoperative training in and postoperative use of noninvasive ventilation is recommended for patients with FVC%p <50% but is necessary for patients with FVC%p <30%.32 The risk of post-operative respiratory complications can be minimized with aggressive use of airway clearance and non-invasive ventilation as a bridge from invasive ventilation. It can be particularly helpful to introduce the assisted airway clearance strategies in the preoperative period if the patient does not already have an effective airway clearance regimen. In addition, a drop in FVC%p below 40% is recommended as a threshold below which manual and mechanical assisted cough techniques are necessary to support effective airway clearance.6,32 Transition between these clinically relevant pulmonary function categories commands a change in patient care and management, as summarised in Table 2. 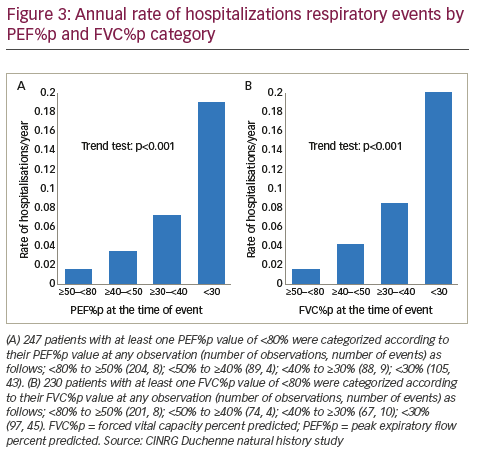 Like a drop in FVC%p, a decline in PEF%p is also directly correlated with bronchopulmonary complications, such as airway infections, and the risk of hospitalization for any respiratory reason, as shown from data obtained at the CINRG DNHS (Figure 3). Peak cough flow (PCF) is the peak flow generated during a cough and is used to objectively define airway clearance. Specifically, when the PCF falls below 160 l/min, the likelihood of successful extubation and airway clearance during an acute respiratory illness declines substantially, and patients with a PCF below 270 l/min are likely to fall below 160 l/min when viral illnesses occur and have problems with airway clearance.6,32–35 However, this risk can be managed with the use of assisted airway clearance therapy. Therefore, once PCF declines below 270 l/min it is recommended that patients be started on assisted airway clearance with the cough assist device.32,33 This is important because in the face of inadequate airway clearance, an otherwise benign upper respiratory tract infection can lead to lower respiratory tract infections and place the patient at risk of acute respiratory failure. There is general agreement that ambulatory patients with DMD benefit from GC treatment,41 often started already in patients as young as ~5 years of age.2 The therapeutic objective of GC treatment is to slow the decline in muscle strength and stabilize pulmonary function. The use of GC has been shown to prolong ambulation by several years,42 but the majority of GC-using patients become non-ambulant by approximately 14 years of age. More recently, continued treatment after the patient becomes non- ambulant has also shown clinical benefit, such as reduction in the risk of progressive scoliosis, stabilization of pulmonary function and delay in the loss of upper limb function.4,43–47 The results of these and other clinical reports support the use of GCs, which have become the mainstay of DMD disease management.48–50 However, their chronic use in clinical practice has been hampered by significant adverse events and not all patients respond to GC to the same extent. The effect of GC use on pulmonary function has been analysed from the CINRG DNHS.4,17 These data show that onset of pulmonary function loss is delayed by ~2–3 years in patients receiving GCs compared to patients not on GC therapy (Figure 4). However, further analyses of the CINRG dataset show that once pulmonary function decline is established (i.e. falling below 80% of predicted), the year-to-year drop in mean FCV%p by year of age on average is similar in all patients (i.e. 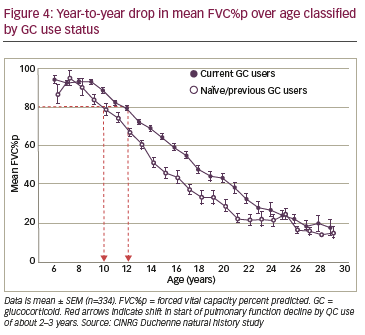 those using GCs vs. GC-naïve or previously GC-treated patients) down to 20 years of age where the FVC%p of GC-naïve patients approaches a nadir. Importantly, despite the use of GC, pulmonary function decline continues linearly and unabated from the age of approximately 10 years through to the early twenties (Figure 4). The observed treatment difference (between idebenone and placebo groups) for PEF%p for the change during the one-year follow-up period in the intention to treat (ITT) population was 6.27% (95% confidence interval [CI]: 0.61–11.93; p=0.031). This magnitude for the observed treatment difference is comparable to the reported natural rate of decline over one year (see Table 1), thus the treatment difference is clinically relevant for patients not taking GCs. The observed treatment difference for FVC%p of 3.27% (95% CI: -0.43–6.97; p=0.082) corresponds to approximately half the magnitude of the expected decline over one year in untreated patients. 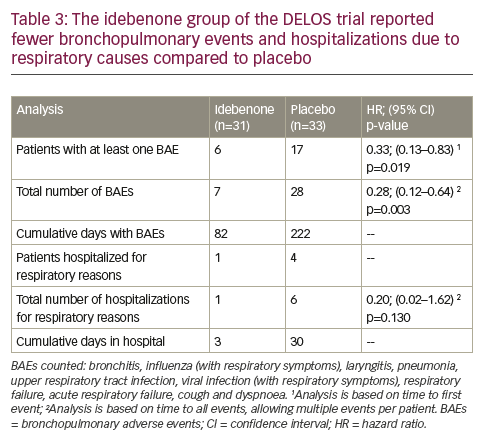 Additional analyses of the DELOS trial showed that more patients in the placebo group compared to the idebenone group experienced bronchopulmonary adverse events (BAEs).59 In the placebo group there were 17 patients reporting 28 BAEs, compared to six patients reporting seven BAEs in the idebenone group. The hazard ratios (HR) calculated for the time to first BAE (‘by patient’) (HR 0.33, p=0.019) and for time to any BAE allowing multiple events per patient (‘all BAEs’) (HR 0.28, p=0.003) indicated a clear idebenone treatment effect (Table 3). The overall duration of BAEs was 222 days (placebo) versus 82 days (idebenone). The higher frequency of BAEs in the placebo group was also reflected in the number of serious adverse events leading to hospital admissions due to respiratory causes. There were four patients in the placebo group hospitalized six times for a total of 30 days, compared to only one patient in the idebenone group hospitalized once for three days (Table 3). Since mortality from respiratory failure in DMD occurs during acute respiratory illness requiring hospitalization, these findings of reduced respiratory illnesses and hospitalizations is an extremely valuable outcome. In addition, there was also a difference in the use of systemic antibiotics utilized for the treatment of BAEs. In the placebo group, 13 patients (39.4%) reported 17 episodes of antibiotic use compared to seven patients (22.6%) reporting eight episodes of antibiotic use in the idebenone group. Furthermore, patients in the placebo group used systemic antibiotics for longer (105 days) compared to patients in the idebenone group (65 days). As mentioned in Table 2, a drop in FVC%p below clinically relevant thresholds commands changes in patient care and management. When the data from the DELOS trial were evaluated relative to the FVC%p thresholds described earlier, there was also benefit with idebenone treatment. 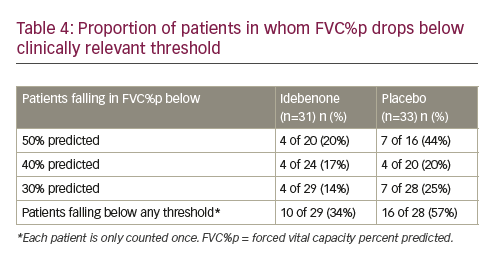 In the idebenone group at study entry, 20 patients presented with FVC%p above 50% and in four (20.0%), the FVC%p fell below 50% during the study. In the placebo group, at study entry there were 16 patients with FVC%p above 50% at baseline and seven (44%) declined below 50% during the study (Table 4). Similarly, higher proportions of patients in the placebo group had FVC%p below the 40% and 30% thresholds respectively. As shown, there was a higher proportion of patients in the placebo group falling below any clinically relevant threshold for FVC%p (idebenone: 34%; placebo: 57%), resulting in a HR of 0.51 (95% CI: 0.23–1.14; p=0.099) in favour of the idebenone treatment group. In summary, emerging evidence supports the therapeutic potential of idebenone in slowing the decline in pulmonary function in DMD patients. Current evidence for efficacy is available for patients in their teenage years presenting with advanced disease (majority of non-ambulant patients) who were already in the pulmonary function decline stage. Available data consistently demonstrate a treatment benefit with idebenone in patients who were not using GC treatment and for whom there is currently no alternative treatment option. Patients eligible for idebenone treatment could include patients who previously were treated with GCs or in whom GC treatment is not desired, not tolerated or is contraindicated. 1. Mah JK, Korngut L, Dykeman J, et al., A systematic review and meta-analysis on the epidemiology of Duchenne and Becker muscular dystrophy, Neuromuscul Disord, 2014;24:482–-91. 2. Bushby K, Finkel R, Birnkrant DJ, et al., Diagnosis and management of Duchenne muscular dystrophy, part 1: diagnosis, and pharmacological and psychosocial management, Lancet Neurol, 2010;9:77–93. 3. Gayraud J, Ramonatxo M, Rivier F, et al., Ventilatory parameters and maximal respiratory pressure changes with age in Duchenne muscular dystrophy patients, Pediatr Pulmonol, 2010;45:552–9. 4. Henricson EK, Abresch RT, Cnaan A, et al., The cooperative international neuromuscular research group Duchenne natural history study: glucocorticoid treatment preserves clinically meaningful functional milestones and reduces rate of disease progression as measured by manual muscle testing and other commonly used clinical trial outcome measures, Muscle Nerve, 2013;48:55–67. 5. 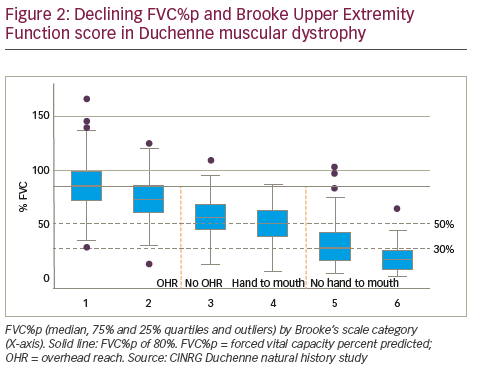 Mayer OH, Finkel RS, Rummey C, et al., Characterization of pulmonary function in Duchenne Muscular Dystrophy, Pediatr Pulmonol, 2015;50:487–94. 6. Bushby K, Finkel R, Birnkrant DJ, et al., Diagnosis and management of Duchenne muscular dystrophy, part 2: implementation of multidisciplinary care, Lancet Neurol, 2010;9:177–89. 7. Finder JD, Birnkrant D, Carl J, et al., Respiratory care of the patient with Duchenne muscular dystrophy: ATS consensus statement, Am J Respir Crit Care Med, 2004;170:456–65. 8. Birnkrant DJ, Ashwath ML, Noritz GH, et al., Cardiac and pulmonary function variability in Duchenne/Becker muscular dystrophy: an initial report, J Child Neurol, 2010;25:1110–5. 9. Landfeldt E, Lindgren P, Bell CF, et al., Compliance to care guidelines for Duchenne muscular dystrophy, J Neuromuscul Dis, 2015;2:63–72. 11. Buyse GM, Gueven N, McDonald C, Idebenone as a novel therapeutic approach for Duchenne muscular dystrophy, European Neurological Review, 2015;10:189–94. 12. Quanjer PH, Stocks J, Polgar G, et al., Compilation of reference values for lung function measurements in children, Eur Respir J Suppl, 1989;4:184S–261S. 13. Hankinson JL, Odencrantz JR, Fedan KB, Spirometric reference values from a sample of the general U.S. population, Am J Respir Crit Care Med, 1999;159:179–87. 14. Gauld LM, Kappers J, Carlin JB, et al., Height prediction from ulna length, Dev Med Child Neurol, 2004;46:475–80. 15. Gauld LM, Kappers J, Carlin JB, et al., Prediction of childhood pulmonary function using ulna length, Am J Respir Crit Care Med, 2003;168:804–9. 16. Meier T, Rummey C, Leinonen M, et al., Characterization of pulmonary function in 10–18 year old patients with Duchenne muscular dystrophy, Neuromuscular Disorders, 2017;27:307-314.Muscle Nerve, 2013;48:32–54. 18. Buyse GM, Voit T, Schara U, et al., Efficacy of idebenone on respiratory function in patients with Duchenne muscular dystrophy not using glucocorticoids (DELOS): a doubleblind randomised placebo-controlled phase 3 trial, Lancet, 2015;385:1748–57. 19. Connolly AM, Florence JM, Zaidman CM, et al., Clinical trial readiness in non-ambulatory boys and men with duchenne muscular dystrophy: MDA-DMD network follow-up, Muscle Nerve, 2016;54:681–9. 20. Connolly AM, Malkus EC, Mendell JR, et al., Outcome reliability in non-ambulatory boys/men with Duchenne muscular dystrophy, Muscle Nerve, 2015;51:522–32. 21. Khirani S, Ramirez A, Aubertin G, et al., Respiratory muscle decline in Duchenne muscular dystrophy, Pediatr Pulmonol, 2014;49:473–81. 22. Abresch RT, McDonald CM, Henricson EK, et al., Pulmonary function characteristics of boys with Duchenne muscular dystrophy: data from the CINRG longitudinal study project, Neuromuscul Disord, 2013;23:738–852 (P.11.12). 23. Humbertclaude V, Hamroun D, Bezzou K, et al., Motor and respiratory heterogeneity in Duchenne patients: implication for clinical trials, Eur J Paediatr Neurol, 2012;16:149–60. 24. Brooke MH, Fenichel GM, Griggs RC, et al., Duchenne muscular dystrophy: patterns of clinical progression and effects of supportive therapy, Neurology, 1989;39:475–81. 25. Mellies U, Ragette R, Schwake C, et al., Daytime predictors of sleep disordered breathing in children and adolescents with neuromuscular disorders, Neuromuscul Disord, 2003;13:123–8. 26. Ragette R, Mellies U, Schwake C, et al., Patterns and predictors of sleep disordered breathing in primary myopathies, Thorax, 2002;57:724–8. 27. Hoque R, Sleep-disordered breathing in Duchenne muscular dystrophy: an assessment of the literature, J Clin Sleep Med, 2016;12:905–11. 28. Sawnani H, Thampratankul L, Szczesniak RD, et al., Sleep disordered breathing in young boys with Duchenne muscular dystrophy, J Pediatr, 2015;166:640-5 e1. 29. Hukins CA, Hillman DR, Daytime predictors of sleep hypoventilation in Duchenne muscular dystrophy, Am J Respir Crit Care Med, 2000;161:166–70. 30. Phillips MF, Quinlivan RC, Edwards RH, et al., Changes in spirometry over time as a prognostic marker in patients with Duchenne muscular dystrophy, Am J Respir Crit Care Med, 2001;164:2191–4. 31. Birnkrant DJ, Panitch HB, Benditt JO, et al., American College of Chest Physicians consensus statement on the respiratory and related management of patients with Duchenne muscular dystrophy undergoing anesthesia or sedation, Chest, 2007;132:1977–86. 32. Birnkrant DJ, Bushby KM, Amin RS, et al., The respiratory management of patients with Duchenne muscular dystrophy: a DMD care considerations working group specialty article, Pediatr Pulmonol, 2010;45:739–48. 33. Bach JR, Ishikawa Y, Kim H, Prevention of pulmonary morbidity for patients with Duchenne muscular dystrophy, Chest, 1997;112:1024–8. 34. Gauld LM, Boynton A, Relationship between peak cough flow and spirometry in Duchenne muscular dystrophy, Pediatr Pulmonol, 2005;39:457–60. 35. Tzeng AC, Bach JR, Prevention of pulmonary morbidity for patients with neuromuscular disease, Chest, 2000;118:1390–6. 36. Eagle M, Baudouin SV, Chandler C, et al., Survival in Duchenne muscular dystrophy: improvements in life expectancy since 1967 and the impact of home nocturnal ventilation, Neuromuscul Disord, 2002;12:926–9. 37. Passamano L, Taglia A, Palladino A, et al., Improvement of survival in Duchenne muscular dystrophy: retrospective analysis of 835 patients, Acta Myol, 2012;31:121–5. 38. Rall S, Grimm T, Survival in Duchenne muscular dystrophy, Acta Myol, 2012;31:117–20. 39. Calvert LD, McKeever TM, Kinnear WJ, et al., Trends in survival from muscular dystrophy in England and Wales and impact on respiratory services, Respir Med, 2006;100:1058–63. 40. Schram G, Fournier A, Leduc H, et al., All-cause mortality and cardiovascular outcomes with prophylactic steroid therapy in Duchenne muscular dystrophy, J Am Coll Cardiol, 2013;61:948–54. 41. Matthews E, Brassington R, Kuntzer T, et al., Corticosteroids for the treatment of Duchenne muscular dystrophy, Cochrane Database Syst Rev, 2016;5:CD003725. 42. Biggar WD, Gingras M, Fehlings DL, et al., Deflazacort treatment of Duchenne muscular dystrophy, J Pediatr, 2001;138:45–50. 43. Biggar WD, Harris VA, Eliasoph L, et al., Long-term benefits of deflazacort treatment for boys with Duchenne muscular dystrophy in their second decade, Neuromuscul Disord, 2006;16:249–55. 44. King WM, Ruttencutter R, Nagaraja HN, et al., Orthopedic outcomes of long-term daily corticosteroid treatment in Duchenne muscular dystrophy, Neurology, 2007;68:1607–13. 45. Houde S, Filiatrault M, Fournier A, et al., Deflazacort use in Duchenne muscular dystrophy: an 8-year follow-up, Pediatr Neurol, 2008;38:200–6. 46. Bello L, Gordish-Dressman H, Morgenroth LP, et al., Prednisone/ prednisolone and deflazacort regimens in the CINRG Duchenne Natural History Study, Neurology, 2015;85:1048–55. 47. Pane M, Fanelli L, Mazzone ES, et al., Benefits of glucocorticoids in non-ambulant boys/men with Duchenne muscular dystrophy: a multicentric longitudinal study using the Performance of Upper Limb test, Neuromuscul Disord, 2015;25:749–53. 48. Manzur AY, Kuntzer T, Pike M, et al., Glucocorticoid corticosteroids for Duchenne muscular dystrophy, Cochrane Database Syst Rev, 2008;1:CD003725. 49. Bushby K, Lochmuller H, Lynn S, et al., Interventions for muscular dystrophy: molecular medicines entering the clinic, Lancet, 2009;374:1849–56. 50. Gloss D, Moxley RT 3rd, Ashwal S, et al., Practice guideline update summary: corticosteroid treatment of Duchenne muscular dystrophy: report of the Guideline Development Subcommittee of the American Academy of Neurology, Neurology, 2016;86:465–72. 51. Timpani CA, Hayes A, Rybalka E, Revisiting the dystrophin-ATP connection: how half a century of research still implicates mitochondrial dysfunction in Duchenne muscular dystrophy aetiology, Med Hypotheses, 2015;85:1021–33. 52. Haefeli RH, Erb M, Gemperli AC, et al., NQO1-dependent redox cycling of idebenone: effects on cellular redox potential and energy levels, PLoS One, 2011;6:e17963. 53. Giorgio V, Petronilli V, Ghelli A, et al., The effects of idebenone on mitochondrial bioenergetics, Biochim Biophys Acta, 2012;1817:363–9. 54. Erb M, Hoffmann-Enger B, Deppe H, et al., Features of idebenone and related short-chain quinones that rescue ATP levels under conditions of impaired mitochondrial complex I, PLoS One, 2012;7:e36153. 55. Buyse GM, Van der Mieren G, Erb M, et al., Long-term blinded placebo-controlled study of SNT-MC17/idebenone in the dystrophin deficient mdx mouse: cardiac protection and improved exercise performance, Eur Heart J, 2009;30:116–24. 56. Buyse GM, Goemans N, van den Hauwe M, et al., Idebenone as a novel, therapeutic approach for Duchenne muscular dystrophy: results from a 12 month, double-blind, randomized placebocontrolled trial, Neuromuscul Disord, 2011;21:396–405. 57. Buyse GM, Goemans N, van den Hauwe M, et al., Effects of glucocorticoids and idebenone on respiratory function in patients with Duchenne muscular dystrophy, Pediatr Pulmonol, 2013;48:912–20. 58. Buyse GM, Voit T, Schara U, et al., Treatment effect of idebenone on inspiratory function in patients with Duchenne muscular dystrophy, Pediatr Pulmonol, 2017;52:508-51. 59. McDonald CM, Meier T, Voit T, et al., Idebenone reduces respiratory complications in patients with Duchenne muscular dystrophy, Neuromuscul Disord, 2016;26:473–80. 60. A phase III double-blind study with idebenone in patients with Duchenne muscular dystrophy (DMD) taking glucocorticoid steroids (SIDEROS). Available at: https://clinicaltrials.gov/ct2/ show/NCT02814019 (Accessed 10/01/2017).